HNS attended Wondercon this past weekend, where we got the chance to sit down and chat with the cast and creators of Marvel’s Cloak & Dagger. Check out our interviews below! About Marvel’s Cloak & Dagger: The collapse of an oil rig in New Orleans owned by the company Roxxon causes two teenagers to become unlikely friends. Tandy Bowen and Tyrone Johnson come from vastly different backgrounds — Tandy, from a very wealthy upbringing, and Tyrone, a boy from Boston who has a stutter. As runaways, the two teens are targeted by drug cartels on the streets of New York City. When circumstances help form a tight bond between the couple, their developing abilities and feelings make things more complicated. *Interviews conducted with multiple media outlets. 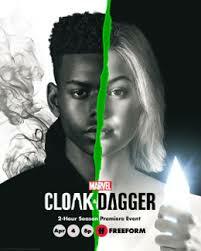 The second season of the American cable television series Cloak & Dagger, based on the Marvel Comics characters of the same name, sees Tandy Bowen/ Dagger and Tyrone Johnson/ Cloak use their superpowers together. The season is scheduled to be released on April 4, 2019, over 10 episodes, on Freeform!